A lot of contemporary poets seem to avoid too many images of nature. They see them as cliche and overused, which I do think is a fair criticism. However, once in a while, a poet will emerge who can use these images to speak to the soul. 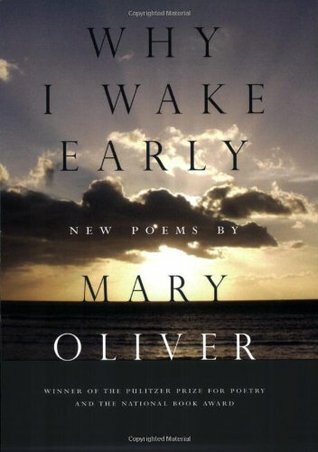 One of those poets is Mary Oliver, and her collection Why I Wake Early is no exception to her history of adding a bit of magic to the world around us. This collection actually came out in 2005, so it’s not her latest offering. Still, I read it recently and just felt compelled to share. Nature is something that we all experience. I love that her poems use these images in complicated ways to speak to universal truths about the human condition. These poems are remarkably accessible, and I think that anyone who is not in love with poetry who wants to give a contemporary poet a try would be mesmerized by this collection. When you read these poems, you can live a moment in Oliver’s world. You can see through her eyes. You can feel what she’s feeling. Unlike the deliberate ambiguity that makes other contemporary poets feel inaccessible to their readers, Oliver invites you in. She wants to share experiences with you and take you on her morning journeys.